You might have heard your athlete friend complain about constant shoulder pain. Well, he could have been suffering from a rotator cuff tear. It is one of the most common conditions experienced by athletes and sports people. A rotator cuff is basically a collection of four muscles and tendons surrounding the shoulder joint. The main objective of the rotator cuff is to firmly position the head of the upper arm bone into the socket of the shoulder, thus making it stable and flexible. An injury to the rotator cuff can result in a mild shoulder ache that can worsen with time. A rotator cuff tears often result from any of the four muscles in your shoulder getting worn or torn due to stress over a period of time. Such a condition results in extreme pain and weakness in the shoulder. A rotator cuff tear can be of two types; partial or complete. Partial Tear: Also called incomplete tear, partial tear results in a damaged tendon but not in a completely severed one. Complete Tear: Often called a full-thickness tear, this type of tear separates the tendons from the bone. How are sports involved in causing rotator cuff tears? Rotator cuff tear is one amongst the most common injuries faced by athletes. Sports such as cricket, tennis, basketball, and weightlifting etc. require overhead activities or repetitive lifting over a long period of time. Athletes involved in these sports involving repetitive arm movements have a greater risk of suffering from rotator cuff tears. Motions like repeated arm swings can cause great stress on the shoulder which will gradually lead to a rotator cuff tear over time. 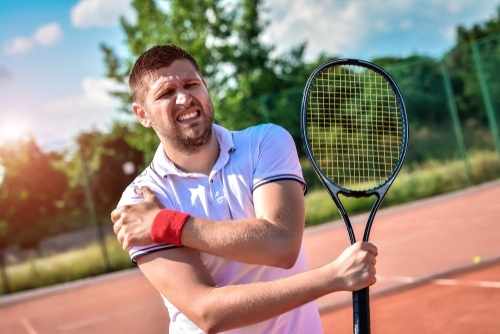 Are you suffering from a rotator cuff tear? Your worry now ends. There are first class centers that provide reliable, state-of-the-art rotator cuff injury treatments in India. Visit Ortho One- Sakra World Hospital, one of the best orthopedic hospitals in Bangalore. The proficient team of doctors led by the reputed shoulder specialist Dr. Banarji BH provides treatments par excellence. Book your appointment now itself! !